One of my readers brought James Howard Kunstler to my attention – yet another cranky prophet-wannabe with no credentials in the domains he discusses. A few years ago, he opined on tattoos thusly: “Tattooing has traditionally been a marginal activity among civilized people, the calling card of cannibals, sailors, and whores. The appropriate place for it is on the margins, in the back alleys, the skid rows. The mainstreaming of tattoos is a harbinger of social dysfunction.” You see, social collapse has nothing to do with predatory banks, preemptive invasions, punitive theocracies, unequal distribution of wealth. No sir! Tattooing is the true cause of the impending apocalypse. Along with rock music, long-haired men and women in the professional work force. I have mentioned a few times that my father’s side were seamen – captains and engineers in the merchant marine. They lived the hard lives of sailors, probably softened by their relative status within the iron hierarchy of ships. Several died away from home, including my grandfather and two of my father’s brothers who died in their twenties of TB, a perennial scourge of the profession back then. We don’t even know where some are buried. In their brief shore leaves, I suspect many of them got tattoos. I recall seeing a shadow under the thin fabric of my eldest uncle’s summer shirt, but I didn’t get to ask him before death took him. This August, I got a tattoo. I asked my friend Heather Oliver (whose artwork graces this site and my stories) to create a design for me. She rose to the challenge magnificently. By this act I wanted to honor my father’s line, now going extinct (I’m the sole twig left of that once-great tree); to mark the narrow escape from my first brush with cancer; and to remind myself that I should try to finish and publish my stories before the Hunter stoops on me for the final time. Tattooing means different things across people and cultures – but it’s interesting to consider that outside the West, tattooing done willingly was often a status symbol, from the Scythians to the Maori. To a large extent, it is also considered a rite of passage and/or a signal of entry to a soldier-like fraternity, whether this is the army, a criminal organization, a prison group or the Knights of St. John; in this guise, the practice has been associated with masculine “bravery” (since it involves pain) and group identity. These aspects of the process are highlighted in one of the best SF novels, Donald Kingsbury’s Courtship Rite: an Earth ship has ended up on a planet whose lifeforms are poisonous, forcing the human settlers into carefully regulated cannibalism – although they have retained enough technology to engineer some foodstuffs. Children are raised communally and watched for signs of a talent. When one is discerned, they receive their first tattoo, become members of an extended family and acquire human status (aka: they’re no longer potential food). In my own stories, the Koredháni people, who consciously decided to adapt themselves to their new planetary home, are matrilineal and polyandrous because of a dearth of women (they also hail from the Minoans, who seem to have had at least one of these tendencies). The second night after a handfasting, the co-husbands give the newcomer a tattoo (using nanotech, which is prominent in their living arrangements). The design, chosen by the newcomer, almost invariably marks his previous allegiance or provenance, so that memory of his lineage is kept alive even after he is part of his wife’s hearth. On the individual level, people often get a tattoo to decorate a scar – a gesture of defiance against the ravages of illness. Also, recent technology advances have made possible the use of tattoos as medical monitors: glucose meters for diabetics, for example, removing the need for constant needle jabs. The flip side of all this neat stuff, of course, is forcible tattoing, which predated the Nazi concentration camps: slaves and soldiers were routinely tattooed in the Roman empire to prevent them from running off. It was deemed more humane than branding. Its Hellenic name “stigma” (dotting) led to the term stigmatize, with its known connotations. 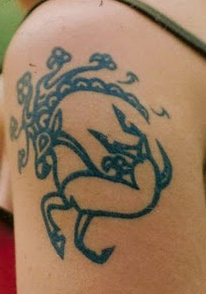 For me, it’s interesting to think that tattoos, despite their vaunted “permanence”, are among the first of our parts to disappear when our bodies rest in fire, water or earth – unless we have the luck of the young Pazyryk warrior priestess who merited six horses in her journey to the other world. Her kurgan was filled with water which then froze. So when Natalia Polosmak opened the tomb in 1993, its occupant emerged almost entirely intact, from her wild silk blouse to her gold-inlaid felt headdress… and the ravishing soot tattoo on her shoulder. 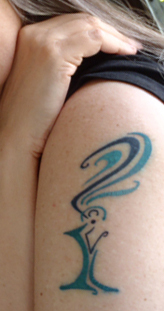 She was a shaman; and in the end, tattoos are talismans: a way of reconnecting with what we sundered from when we became (perhaps too) self-aware. Images: 1st, Deena Metzger’s famous self-portrait; 2nd, a recreation of the Pazyryk shaman’s tattoo; 3rd, Candleflame Sprite; design by Heather D. Oliver, execution by Deirdre Doyle. This entry was posted on Tuesday, October 25th, 2011 at 8:49 pm	and is filed under Biology & Culture, History, Science Fiction & Fantasy. You can follow any responses to this entry through the RSS 2.0 feed. Both comments and pings are currently closed. I believe someone thinks he’s carrying the torch of colonial Britain. That attitude toward tattooing or anything deemed “primitive” smacks of a particularly staid and yawn-worthy sort of elitism. Not even that. It smacks of middle-of-the-road conventional thinking. This is apparently someone who wants to be considered an intellectual leader and a contrarian (as most “futurists” do, with little justification). I can’t think of tattoos these days without thinking about this XKCD comic. Since my sister’s recent cancer experience. She’s planning to get a more elaborate tattoo to cover up her dots. Tattooing is just another tribal designation for Kunstler, a way to tell the “right people” from the “wrong people”, an easy, visible, designation that is essentially meaningless. If the people he were trying to court were into tattooing, he’s pick something different to identify the “others”. Yes. For a contrarian kunstler is amazingly reactionary. I can just hear him yelling at a group of young kids: Get. Off. My. Lawn…because manicured lawns and colonial architecture is the only way to build. He’s just a grump. No particular insight or rebellion against the status quo there. I did think it interesting Kunstler has been a disaster for a whole host of reasons (sandbagging the left with despair and fatalism, predicting disaster practically every year, views on Israel-Palestine only slightly less regressive than Alan Dershowitz, and bigotry towards black people as expressed in how he blamed us for not assimilating) and I like seeing him criticized for any valid motive. I’ve often been baffled by why he’s taken so seriously by so many, but then I also suppose I’m not exactly the kind of person he has a shred of interest in as a black man from one of those generations he derides as a bunch of ‘overfed clowns’. From what I hear, I’m increasingly glad I haven’t read more of Kunstler’s writing. Well…I did actually enjoy some of his mid-career critiques of modern American architecture and city planning (city planning is my profession). The “national automobile slum” IS a disaster from a variety of economic, health, and cultural perspecitves. And, his Eyesore of the Month postings are HILARIOUS quite often. He punctures the pronouncements of frankly ridiculous high art architecture and the brutality of modern American urbanism. Anyone who has experienced an American city downtown which consists of blank walled concrete government buildings and parking garages cannot deny he is correct about at least some things. As with all doomsaying prophets, he does have a problem with timing. Not sure, ultimately, he is wrong w/r/t peak oil and the like. The tattoos are cool, though. As someone who is 110% needlephobic, there is no way in h$#@ I would ever get one! I wish I had known of Tom Murphy’s blog earlier. His views would have been a very interesting addition to our discussions about space exploration. Kunstler, on the other hand, seems to say little that hasn’t been said earlier and better (by Jane Jacobs, for instance). You can say hell, Brian — this is a blog for adults! Contemporary tattooing is fast and relatively painless (of course, this depends on the body part as well). To me it felt like quasi-gentle scratching. On the other hand, traditional Maori ta-moko and its cousins are truly painful. Tom Murphy is a major recent find for me as well. There is such faith out there that human ingenuity can solve EVERY problem…he throws this into question somewhat dramatically. Note…I’ve not read all the Stirling novels, just parts…. “Humans’ curiosity and deep thought horizons have fuelled our vision of exploring space, which has rested on two deeply embedded assumptions. One is that we can overcome everything, given enough technology. Another is that settling on other planets will be about as difficult as it was for our hominid ancestors to expand across Earth. Feudalism might be “better” if it involved any degree at all of noblesse obligee. I don’t see it at all…our current warlords and lords of financial gambling are SHOCKED that anyone would question them in any way. Ditto to everything said concerning Kunstler. I believe that what Kingsbury’s culture was doing was scarification, not tattooing, from what I remember of the book. And as I recall, the risk of ending up on the menu was present all through a person’s life – screw up enough, or badly enough, and you were invited to make your contribution to the race, or some such euphemism, however old and well-established you might be. Agreed, though, it’s a good book and didn’t receive enough attention. I believe you’re right, though Maori moko is scarification tattoing. You’re also right that they were never safe from being “invited to contribute” — which kept everyone on their toes (as did their courtship rites). Re Tom Murphy: judging by his post Stranded Resources, his basic stance is the straw man argument. He does not seem to be engaging seriously with the basic ideas of J. S. Lewis and G. K. O’Neill. I would suggest that he be read with care. I’m glad you liked the tattoo designs, Stephen. On Tom Murphy, we’ll have to agree to disagree. We’ve had the discussion of resources before, and you know I consider your arguments totally unconvincing. It’s an interesting idea that his opinions are those of the “futurists.” I often wonder why tattooing became so popular lately amongst middle class Americans. I personally believe it’s because technology has advanced so much that life for this group became predictable and easy. Tattooing is a way to express oneself. Maybe even identify with outlaw groups like the Angels or sailors. Pull yourself out of your mundane existence. Or at least make others think you are pulling yourself out. When I grew up sailors and bikers were the only ones that got tattoos. It was a way to identify themselves as part of that group. Maybe that contributes to people wanting to get a tat. It makes us feel tough like the members of those groups are assumed to be. Or, is it because all those National Geographics we grew up on had an effect? We’ve seen other cultures and appreciate them. Or, are our movie and rock stars doing is so we do it? Is this just a fad amongst the middle class and will pass one day? So many people are getting them, there is no way to align yourself with bikers and sailors anymore. We can’t all be bad boys. Some of us have to maintain the center or there is no such thing as “bad.” And most of us do that maintenance. We’ll move on to the next “bad” thing when this one is played out. Thanku! The very same can be said of your video (and the art and history it displays).